It's a late start this morning as the crew sleeps off jet lag. The morning sun is up now and playfully beckons, its hundred sparkling voices calling us from the chatoyant Caribbean sea. In considering possible destinations for the day, I suggest we choose somewhere west and north. With a southeast wind blowing and waves from the same, this will put the winds at our backs most of the day, which will make for pleasant sailing conditions while the crew gets their sea legs. 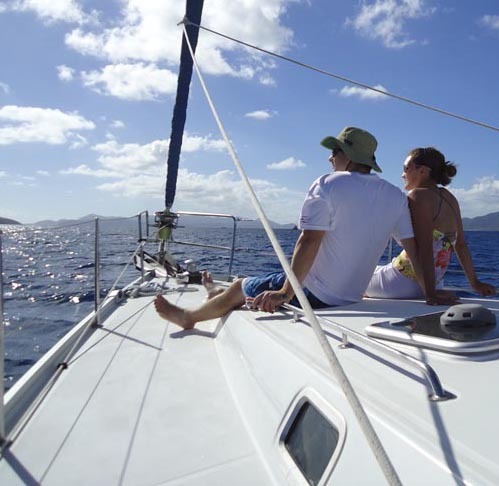 Ultimately we decide on sailing to Soper's Hole for lunch, and then Cane Garden Bay on Tortola's north shore for the night. We enjoy a breakfast of sausage and eggs out in the cockpit as we watch teams of pelicans circling and diving for fish. This morning I saw the largest turtle I've ever seen in my life. It must have been 4 feet in diameter with a head the size of a soccer ball. The winds are fresh this morning, running a little over 20 knots. During checkout, Conch Charter's Emma had explained the Cyclades' sailing tendencies thusly, "She's a lively boat. Lots of sail, little bit of keel." Taking this advice to heart - and not wanting the crew's first full day on the water to be of the white knuckle, thrilling variety - we tucked in a reef. Good choice. Under full jib and a single reef, the boat surfed gently and powerfully along at about 10 knots. We outpaced anything heading towards Sopers Hole, but watched the boats coming out of Sopers Hole as they beat into the waves and wind. I envy them, just a little, enjoying the excitement of close-to-the-wind sailing. In a boat bounding off the tops of waves and crashing down into the trough of the next, the spray is exhilirating. Sailing into a 20 knot wind is sometimes so loud one must yell to be heard by others on the same boat. And yet, once tired of the excitement, all one has to do is turn the boat around 180 degrees. Suddenly the whistling, howling wind stops and becomes a gentle puff of breeze. The dashing spray is turned into a gently rocking cradle, and blood pressure drops to easy-like-a-sunday-morning levels. We enjoy watching them as they pass, bows coming clear out of the water occasionally as they leap from the crest of each wave, keels gripping the sea for traction against the oncoming winds. But not us. Today, we're all about easy, peaceful, downwind sailing. Imbued by the warm sun and pacified by the pleasant following seas, the crew stretches out on the foredeck as the boat tacks toward Sopers Hole. Randall is quickly understanding how to read the windex to prevent an accidental jibe. Although it would be a great day for wing-on-wing sailing (with the main out to port and the jib to starboard), I set a safer, less-direct course by first toward Saint John and then north toward Sopers Hole. This tack makes it easier to keep the wind on the happy side of the main. As we turn into Thatch Island Cut (named for Edward "Blackbeard" Thatch, or Teach) we lower the sails and motor into Sopers Hole. 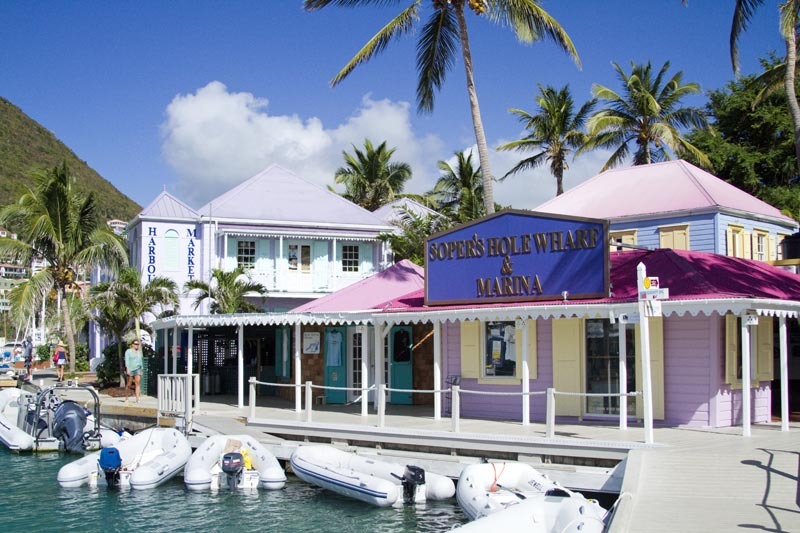 Sopers Hole, or West End as the locals call it, is a port of entry for the BVI and features a full service marina with capabilities to haul large boats out of the water. But we don't care about this today. The wives are interested in a massage at the spa, and Randall and I are dutifully trying to be excited about loitering while they do. Weaving our way past the sleepy boats, we find a mooring near the top of Sopers Hole, near the dinghy docks. Behind us, an experienced couple readies their boat for mooring. It's soon clear to us that this couple's marriage will likely last a very, very long time. Undoubtedly stung by the frantic and sometimes less than respectful communication that happens between the helmsman at the back of the boat and his wife with the boat hook on the bow, this couple had purchased marital peace. The first mate and captain each wore matching his and hers headsets. Watching them pick up their mooring was harmonious, like watching a Hallmark Card be written. It didn't take long to find the day spa. After a few moments, the girls were whisked away into spa heaven, and Randall and I were free to roam around the town. Sopers Hole has several shops selling everything from clothes to souvenirs to a market full of provisions. And a few good places to eat. 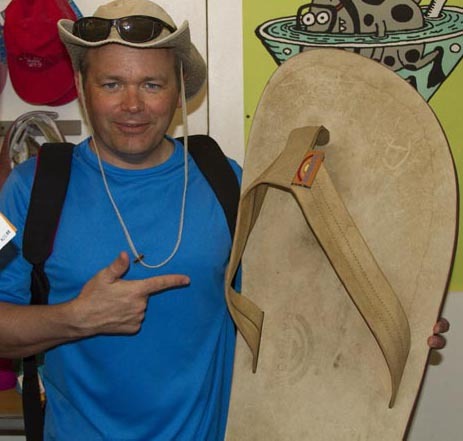 Exploring the shops, I stumbled across this sandal. It reminded me of my youth, when this type of footwear wasn't a "sandal", but a "thong". Now, I'd be completely content to let the word "thong" - as referencing footwear - drift into the past with other lost words. But now "thong" refers to a very different article of clothing. And I noticed one day, quite by accident, that when I mistakenly used the word "thong" (meaning sandals) in front of my teenagers' friends, they were really quite embarrassed. So, this picture is for you, teenaged offspring. "Want to borrow my thong?" Not really intending to purchase this thong, we ventured back out onto the docks around Sopers Hole. The buildings around Sopers Hole are all brightly painted in what can only be described as "pleasantly contrasting" colors. It's as if the painters walk into the paint store and ask themselves, "What is the most completely opposite color I can find?" 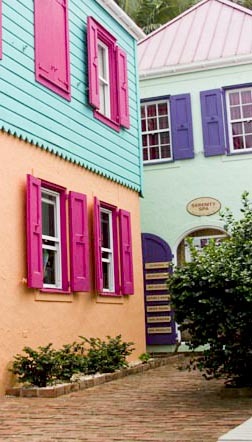 I'm sure if I were to repeat this color scheme at home, my Home Owner's Association would have me keel-hauled. But somehow, down here, it all comes together so tropically. Sopers Hole is a nice place to spend 2-3 hours looking through shops, eating at Pussers restaurant, or just walking around town looking at the interesting buildings. I shot several different pictures as the lighting improved a little. There were numerous passing clouds for much of our stay there, but the sun peeked out occasionally. These buildings are best viewed in full sun, or possibly during a sunset if overnighting. There's more variety in the shops in Sopers Hole than in other places in the BVI. 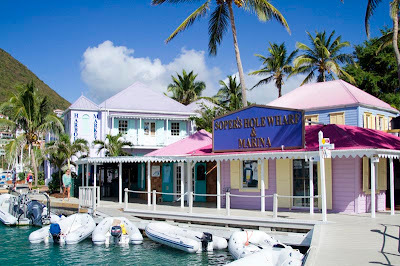 With a full service marina, many full time cruisers stop here for provisioning and boat maintenance. Some of the most interesting stores are the markets, which carry supplies from many places around the world. In several places, the sprawling buildings and shady porches have grown out to crowd around the palm trees along the marina. 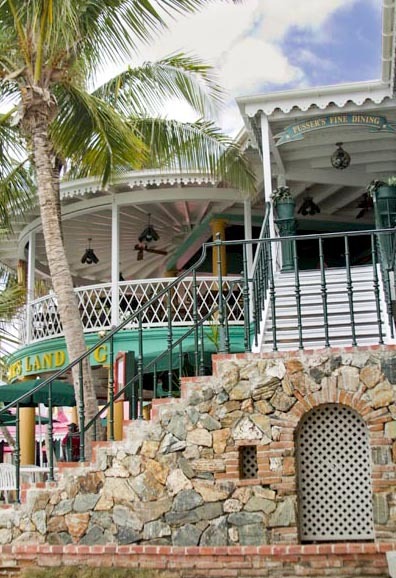 Many of the stores have simply been built around the palm trees, with the tree trunks painted to match the store's interior before they continue on up through holes in the ceiling. 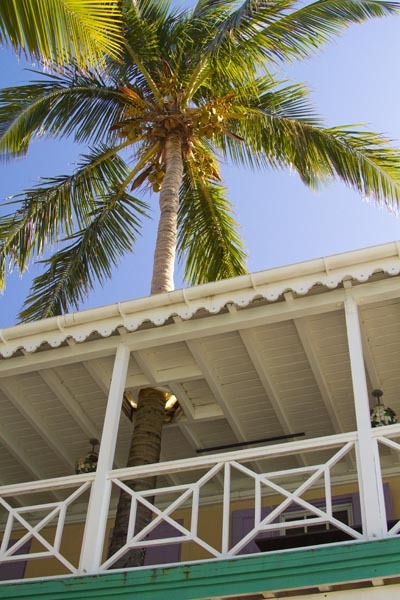 In other places, balconies and roofs are built with holes for the palm trees. Tiny narrow streets thread back and forth up the hillsides towering above Sopers Hole. Peeking out from the trees and bushes are many brightly colored homes. You wonder what keeps the homes from tumbling down the steep hills, or how many stairs are in each of these houses. The views must be fantastic though, sometime I'll hike up the hills to see it for myself. 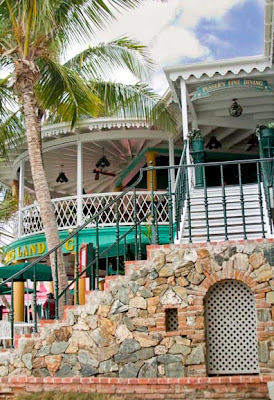 Although we weren't hungry, the warm afternoon sun soon found us over in the shade of Pusser's restaurant for a nap and nepenthe of virgin daquiris while we watched the boats out in the harbor. 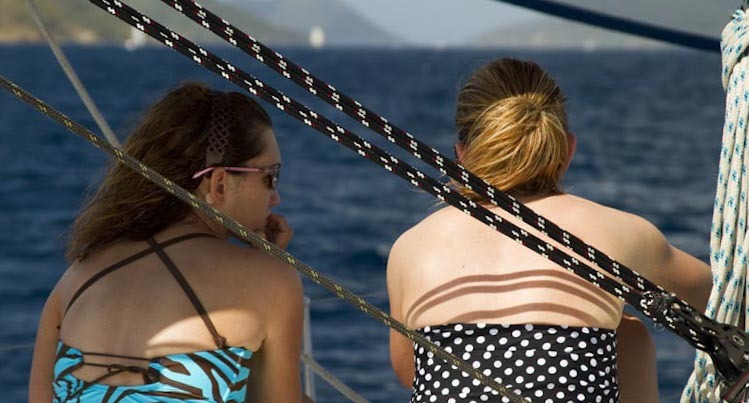 When the girls were done, we headed back to the boat and set sail for Cane Garden Bay. Love the headsets for mooring!